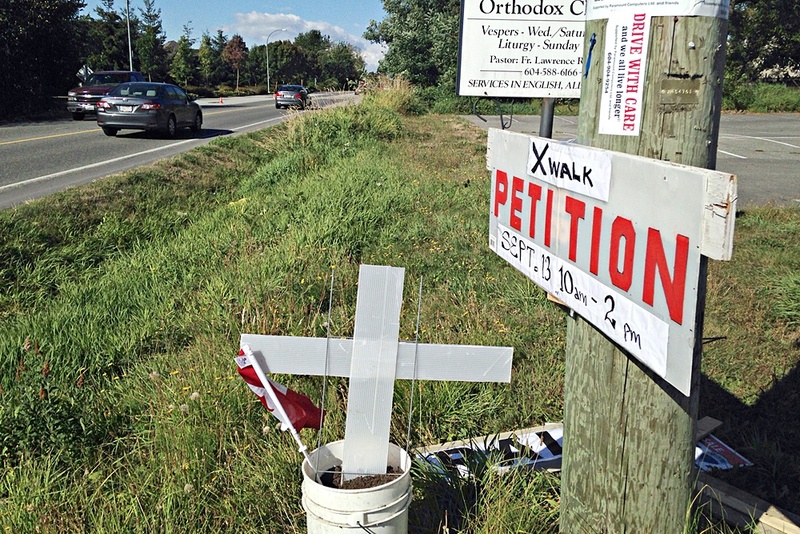 A Langley woman who lives near the scene of a fatal crash said something must be done to improve the safety of pedestrians. Teresa Blades spoke to the Langley Township council Monday night, reading a letter from her husband, a police officer. The couple demanded something be done about major safety concerns for pedestrians along 72nd Avenue from 200th Street to the Surrey border at 196th Street. On Thursday night last week, an elderly couple were hit by a car while trying to cross the road. The 83-year-old man was killed, and the 79-year-old woman was hospitalized. The driver stayed at the scene of the crash, and neither alcohol nor speed appeared to be factors in the collision, police said. Visibility issues with the setting sun may have played a role. Blades was a witness to the aftermath of the collision. â€œThat was very difficult to see,â€ she said. That stretch of road has also been an issue for a number of years. Blades pointed out that the road is broken up due to development â€“ some sections have proper sidewalks and are finished, while others narrow abruptly from four lanes to two, and there are no sidewalks. If the lots have not been developed, there is no sidewalk. She said this forces people to walk on the road in places, and seniors in mobility scooters have to take their chances. Children who live on the south side of the road routinely jaywalk to get to the school bus pickup and drop off point on the north side of 72nd Avenue, she said. â€œItâ€™s very narrow, thereâ€™s just nowhere to go in this one little section,â€ Blades said. Blades wants to see a proper pedestrian-controlled crosswalk along the route to keep people safer. She said the road in general needs to be improved for pedestrian safety. There have been a number of incidents in the last few years along that stretch of road, on both the Langley and Surrey side. In November last year, a boy rollerblading in the 19500 block was the victim of a hit and run, but fortunately was not seriously injured. In April 2013, a young woman was flung into a ditch from a hit and run. Her boyfriend found her while walking in the same area a short time later. Langley Township councillors voted to ask for a staff report on the situation there. One of the empty properties in the area is about to be developed, which will eliminate one of the sections with no sidewalk, but several others remain.